Malaria Pills and Pregnancy - Safe or Not? "This information on malaria pills and pregnancy is so much easier to read than those medical sites. Thanks for the information on all of your pages!" Malaria pills and pregnancy don't always mix. If you're a traveler, there are some things you should know... It might make a difference when you are planning where to go on your vacation. ...and decide how important that trip is. You don't want to get the disease anytime, but especially not when you're pregnant. Malaria infection when women are pregnant can be more severe. Getting malaria can increase problems such as premature births or worst of all, sometimes spontaneous abortion or stillbirth. ...so the very best advice is to avoid travel to areas where malaria transmission is possible when you are pregnant... save the high risk areas for later. Again ... Try to find a malaria free destination or postpone your trip. If you must travel to an area where malaria is present, take the pills.... but... remember, some malaria pills and pregnancy don't mix. You have fewer choices for malaria pills and pregnancy. What that means is that there are fewer malaria pills you can take when you're pregnant. Of the major types of anti-malarial pills currently in use, only half are recommended for pregnant women. Chloroquine has not be found to have any harmful effects on the fetus when used as recommended, so it's OK to take. Mefloquine (Lariam ™) is the malaria pill recommended for areas where Chloroquine doesn't work. It's safe for the last part of your pregnancy... the second and third trimesters. Studies show it's probably safe in the beginning too, but there is less information. Atovaquone/proguanil (Malarone™) is NOT currently recommended for women during pregnancy. This is one of the more commonly prescribed malaria pills as of this date, but there have not been enough studies to prove that it is safe to use when you are pregnant, so you don't want to take the risk. Doxycycline is definitely NOT recommended because it is related to the antibiotic tetracycline. We know Tetracycline causes discoloration and malformed teeth in babies, and it may inhibit bone growth too. Primaquine has never been prescribed for us. I don't think it's too commonly prescribed, but it should NOT be used during pregnancy because it can be passed through the placenta to the infant. There is a condition called G6PD Deficiency. It is an inherited condition where the person or fetus lacks a certain enzyme... Most people with G6PD Deficiency don't have any symptoms, but if your baby is exposed to Primaquine (and some other drugs) it can cause hemolytic anemia in the baby before birth... and that could even be fatal. If you travel to a malaria area when you are pregnant, follow all the safety measure for mosquito avoidance.... avoid the bites! Remember that mosquitoes are most active between dawn and dusk so remain in well screened areas then if you can. 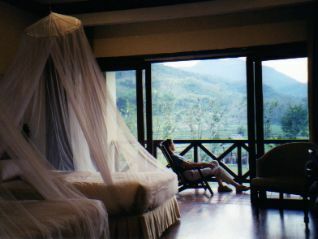 Use mosquito bed nets where they are provided... they're not for decoration. Use an insect repellent that is effective against mosquitoes (look for one with DEET). Wear long sleeves and long pants to keep the mosquitoes off. Consider buying clothes that are bug resistant. You can find them at sporting goods stores and in catalogs. We always want you to remember that we are not medical professionals. We're just trying to interpret what they say for you.... to make it easier to understand your risks. The bottom line is... from what we can tell... if you are a pregnant traveler who can choose when and where to travel... go someplace without malaria risks or go later and be safe. That way you won't have to worry about malaria pills and pregnancy.